Why do I like Michigan better than, say, Seoul or Chicago? There are pluses and minuses but a lot boils down to climate. Michigan has REAL snow. Seoul usually gets a few inches of snow a year and, although it makes things slick, it usually just gets slushy and dirty. You only want it to go away. Chicago isn't a lot better. Chicago gets about 40 inches (1 meter) of snow a year but it quickly gets dirty and packs down into ice on the sidewalks and streets. 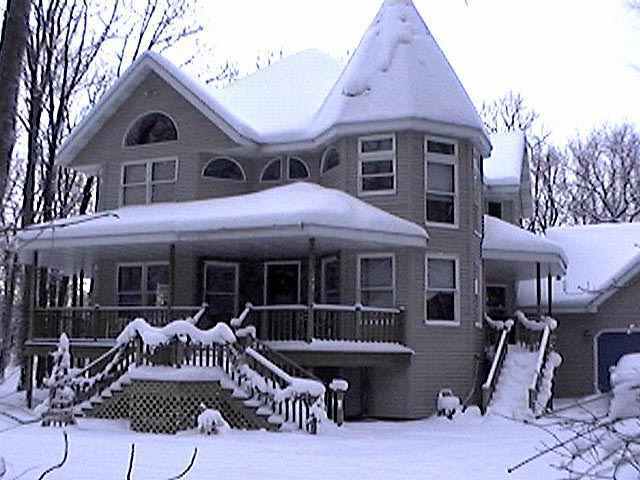 In southwestern Michigan we get 70 to 80 inches of snow a year (about 2 meters), but it's beautiful. It covers up all sorts of ugliness and manages to stay relatively clean until it starts to melt. It's useful snow. You can cross country ski, sled, snowmobile etc. for more than one or two days after a snowfall. Also, with a legitimate claim to be living in "snow country", you can stay home in the winter without any other good reasons. You can buy an SUV and not feel guilty (if you're into those things). You can create havoc with a chainsaw and a 4WD pickup and claim you are ecologically sensitive because you are heating with wood. The secret to Michigan's climate and terrain is, of course, the Great Lakes. It's a big state but every place in Michigan is less than 100 miles from one of the Great Lakes. And, unlike smaller lakes, the Great Lakes control the climate in the same way oceans do. Although we live directly across Lake Michigan from Chicago, we get twice as much snow due to the "lake effect". The lake also moderates the temperature. Near the lake, we get about a 10 deg F (5 deg C) break in the maximum and minimum temperatures. I know some people wouldn't brag about seldom going below -10 F (-25 C) but it is better than -20 F. Next to the lake, high temperatures in the summer don't exceed 90 F (32 C) and usually don't get higher than the low 80's (28 C). 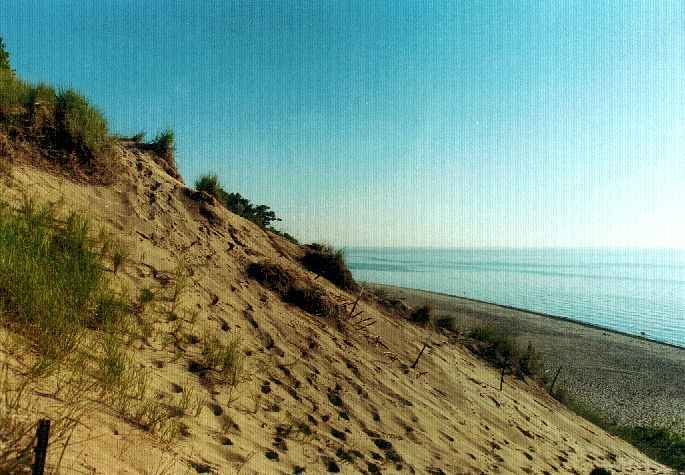 Another unexpected feature of the Lake Michigan shore is the sand dunes. Most of the shoreline is dunes. You might not recognize them at first, since they are ancient, stable sand dunes covered by thick forests of oak and other hardwoods but they are true sand dunes. In fact, sand mining is a major industry. That's right, we have strip mines for sand. This Lake Michigan sand is unique in it's grain size and uniformity making it ideal for metal molds and other industrial uses.